Hi! Welcome to Dansm's Acoustic Guitar Page. My name is Dan Smith, I'm a first-year grad student at Harvard, and I've been playing guitar for 5 years now. My first guitar was a Washburn D-10 acoustic, a great guitar for beginners. A year later I bought an electric and dove into Eagles electric parts. 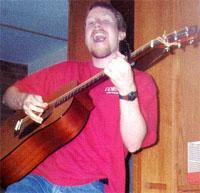 During the summer of '96 I went back to my musical roots: John Denver and Simon & Garfunkel; and started fingerpicking. I began singing and fell in love with my acoustic again. I bought the Martin D-1 that you see at right in May '97, and I haven't stopped playing since. I've started performing locally and started writing a lot of songs, some of which will be featured at Daniel Smith: Singer/Songwriter. To learn more about me, check out my personal page. This page went up in April '97, and it's slowly grown to be the largest acoustic page on the web, with a huge collection of lessons and the largest set of acoustic songs anywhere. I hope you enjoy what I've done. So kick back, dust off that guitar, and discover the world behind my favorite instrument: the acoustic guitar. This site contains an acoustic guitar song page, links to other acoustic guitar sites, and lessons for acoustic guitarists. It encompasses all types of music from rock to folk in all eras of modern music. These pages incorporate fingerpicking and other techniques, so almost everyone can find something they like. Whether your favorite artist is James Taylor, Martin Sexton, or Nirvana, you can find material tailored to your needs and interests. The page is designed to help all acoustic guitarists have fun and make the most out of the instrument, so enjoy it! Designed for or higher running at 800x600 resolution. On May 17, 1997, I bought a Martin D-1, a gorgeous guitar which sounds even better. Martin is a legendary acoustic guitar company, producing hand-made instruments in Pennsylvania since 1833. Their web page can be found here. My D-1 looks like the one at right. If you are interested, you can purchase a D-1 from Musician's Friend. For some information on how Martin makes their guitars, check out my review of their CD-ROM called "Martin Guitar Company Interactive Factory Tour." To hear some sound clips of my Martin, check out Daniel Smith: Singer/Songwriter. I would definitely recommend a Martin to anyone, because they are phenomenal guitars. chord formation for beginners, covering both basic chords and barre chords to better understand tab notation, chord notation, or standard musical notation, visit this page! lessons on basic techniques: slide, bend, hammer-on & pull-off, etc. ; great for beginners! suggestions for learning guitar using great lessons from across the web. If you just bought a guitar, come here! a comprehensive list of common guitar chords--use this page!! I play local solo acoustic gigs; go here for sound clips, lyrics, and a performance schedule! my collection of the best freeware for guitar: tuner, metronome, tablature, and chord software, plus more!